This tutorial will review the user management in Drupal. 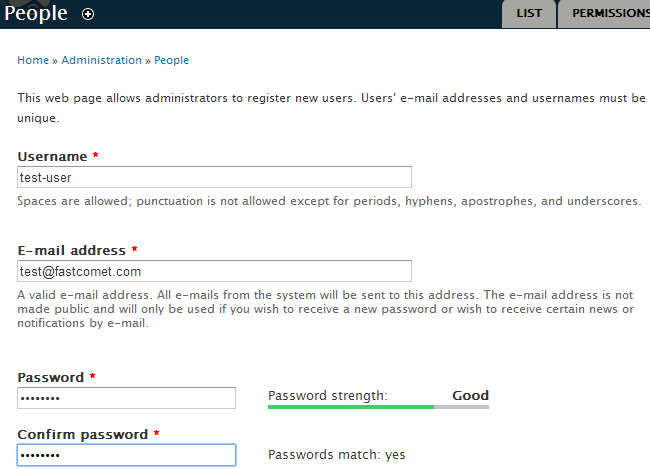 This is an important feature that allows you to manage the people that have active registration on your website. To access the user manager, you need to log into your website as administrator and then navigate to the People tab from the main menu. To add a new user, simply access the user manager and click on the Add user button at the top of the page. Username: Enter a username for the new user. E-mail address: Enter the system email for the new user. Password: Enter a password for the user. Status: Set the user as Active. Roles: Enter roles for the new user. Choose this carefully as this will determine the permissions for the new user on your website. Click on the Create new account button. To edit a user’s role, you need to access the user manager and click on the Edit button next to the user you wish to edit. Locate the Roles section and check the roles that you wish to assign for the user. To block a user, simply access the user manager and check the user that you wish to block. Then select the Block the selected users option from the Update Options field. Click on the Update button to keep the changes. To remove a user from your website, you need to access the user manager and check the user that you wish to block. Then select the Cancel the selected user accounts option from the Update Options field. Click on the Update button and then select one of the removal options available. 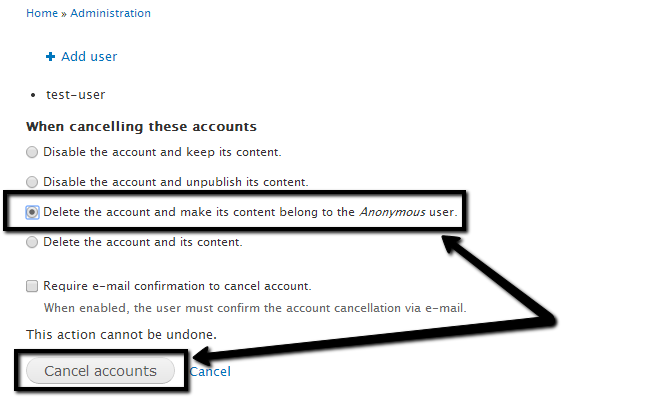 Then hit the Cancel accounts button to remove the account.